Let’s get right to it! 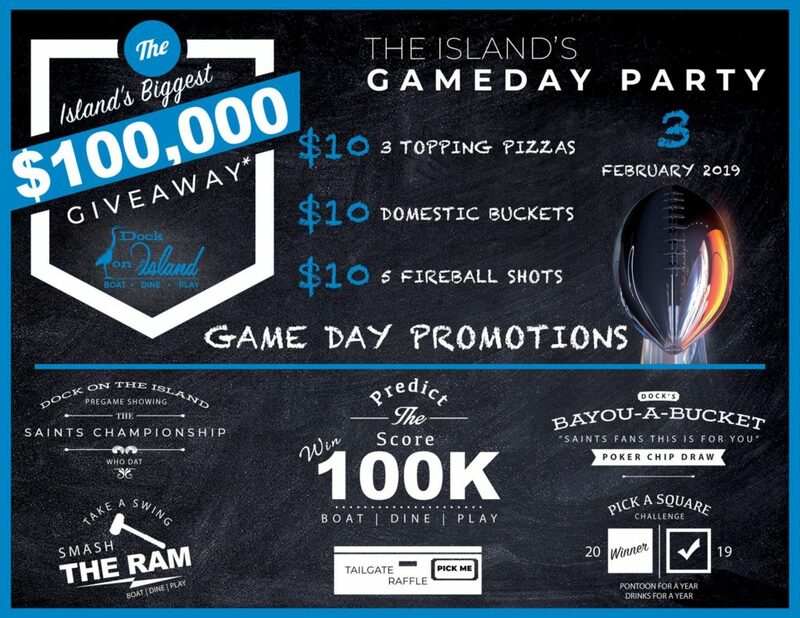 FUBAR Pizza and Dock on the Island are both running separate Super Bowl Giveaways where you could win $100,000! 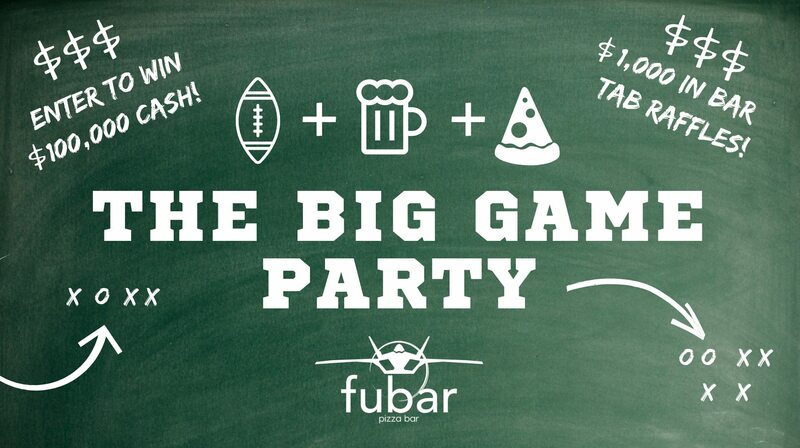 FUBAR Pizza: In order to participate and possibly win, you must guess the halftime & final score! You must be 18 to enter-to-win and participation is limited to the first 350 people to register. Your score prediction must be written on an official entry sheet and submitted to the promotions team on location ‪between 2pm-5pm on Sunday, February 3, 2019‬. Oh, and you have be present at FUBAR at both halftime and end of the game to be eligible to win. Dock on the Island: Their “Predict the Score Challenge” is setup pretty much the same as FUBAR’s. Correctly predict the halftime score and final score and win the $100k! The first 200 guests to fill out an entry form have a chance to win! Registration forms will be available between 12pm-3pm on Sunday, February 3, 2019. You also must be present at halftime and the end of the game to win. In addition to these 2 awesome giveaways, Dock on the Island is hosting “Smash the Ram”. “Your team miss out on playing in the big game? Refs blow a major call costing your team a game? That’s ok, come here let out some frustration by smashing the Ram with our custom designed Sledge Hammer! The Smash the Ram action station will be up and running from 12pm until 30 minutes prior to kickoff. So there you have it! 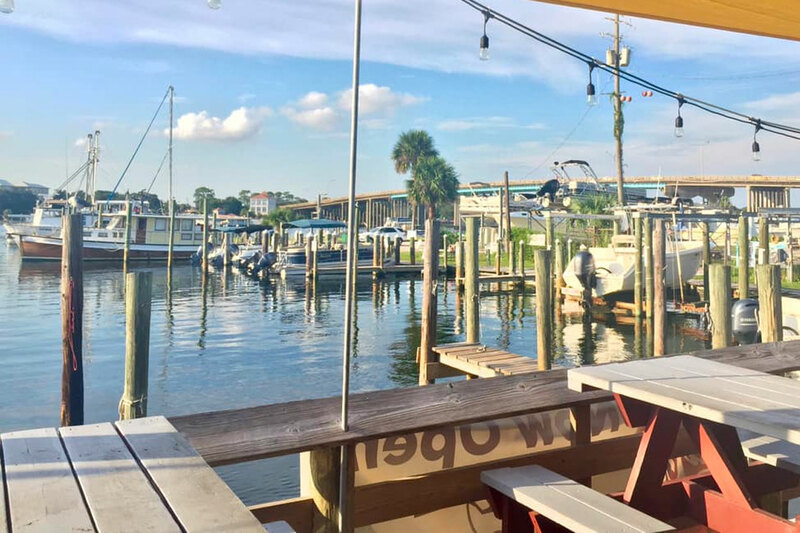 Your shot to win $100k at one of these restaurants on Okaloosa Island? Which one will you pick?